Advantages: Great behind the scenes footage of the 8th Air Force ; great inspiration for modellers. What happened behind the scenes at 8th Air Force Headquarters? How were targets selected and who had what part to play? Those are just some of the questions that this film answers. Before the main feature there is a short video of General HapArnold explaining why it is important to fight the war. He is noticeably uncomfortable in front of the camera but it is nice to put a voice to such a historic face. The main feature of the DVD includes scenes that are used in other documentaries. If you are looking for an action packed video this may not be your cup of tea. Don’t get me wrong, there are some great action sequences in this film. The primary focus of this film is not the actual bombing and fighter strafing, it is on the planning and execution. The men behind the scenes, the rear echelon mother f***ers, or REMFs for those who have never served. These are not professional actors and many of the airmen look uncomfortable in front of the camera, especially General H.H. Arnold. Weather, bomb selection, target selection, ingress and egress routes, search and rescue, aircraft survivability equipment, and all the other small, but essential elements are brought together to contribute to the successful execution of the bombing mission. The actual bombing mission is an exciting sequence with plenty of flak and fighters. After the mission, the recovery of downed aircrew, taking care of the wounded, and repair of the aircraft brings this DVD to an end. Literally, everything from the beginning to the end of the mission is covered in this film. What is impressive is the amount of personnel involved to make just one mission happen. The thousands of men and women who changed the history or aerial warfare. When the mission starts you are treated to many different views of the B-17s and B-24s, some very unique. The nose art on the bombers is interesting to say the least. The shark mouthed B-24 was particularly colorful. The details included in the video will be interesting to the model builder, especially for detailing interiors. The noise of the formation form up had to be phenomenal. Lumbering at 150 feet per minute with full bomb loads you get a perspective of how heavy laden the bombers were. The formation positions are explained horizontally and vertically. It is amazing how these guys were able to get into formation and maintain it for the whole mission. It is no wonder why some guys were bombed out of formation. Complex is an understatement. Impressive doesn’t do it justice. Once the fighting commences you will be impressed by the fighter attacks on the bombers. The flak burst are right there in your face. The bombers are attacked by Bf-109s, FW-190s, Bf-110s and even Me-410s. The video is crystal clear. It looks like video shot for a modern movie it is so clear. Of course it is black and white but even so the quality is exceptional. The bomb results actually are so clear I was wondering if it they were filmed in a studio. If they were they did a really nice job with WWII technology. The end of the mission is highlighted by the return of the bombers, broken and battered. Crash landing with dead and wounded on board. Battle damage is evident on a lot of the aircraft. Debriefing brings the mission to an end for almost everybody, except the bombers crashed in the Channel. That is where the Air Sea Rescue people come into play, plinking people out of the cold water. Red Cross women meet the returning crews with doughnuts and coffee. Final evaluation of the bomb damage assessment brings the whole process full circle. Tomorrow will be another day. 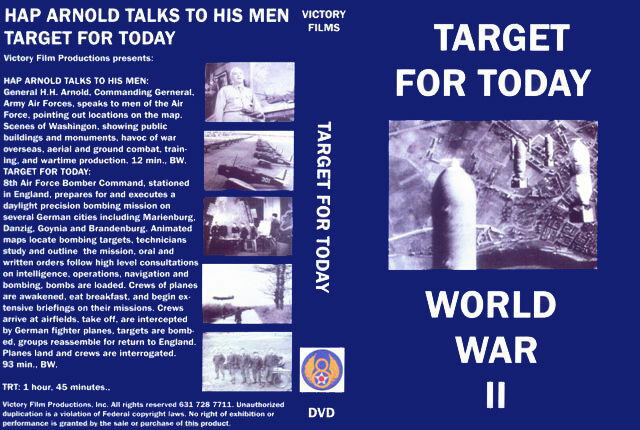 I highly recommend this DVD and the rest of the Victory Films series. The quality of the film is outstanding and the content is interesting. This will answer any questions you ever had about what it takes to execute a bombing mission in Europe in WWII and why they are called the greatest generation.